STRONGER DETOX WITH OUR SUPER DUTY ARRAYS! Perfect Detox Foot Spa Machine for Home Use. By Better Health Company. Comes with everything you need to get started right out of the box. Completely Pre-Programmed for a 30 minute well Balanced Detox with the push of a button. Easy to read laminated instructions. Comes with 2 of our Super Duty Arrays that will give you a stronger, more effective Detox. Value of the 2 Super Duty Arrays alone is $60.00. Also comes with our Informational Foot Detox Brochure and 16 page booklet to teach you all about detox foot baths. 1 year warranty. Put together in the USA. We service what we sell. Free toll free tech support when you need it. COMES WITH EVERYTHING YOU NEED TO GET STARTED RIGHT AWAY. MSRP WAS $199.95. 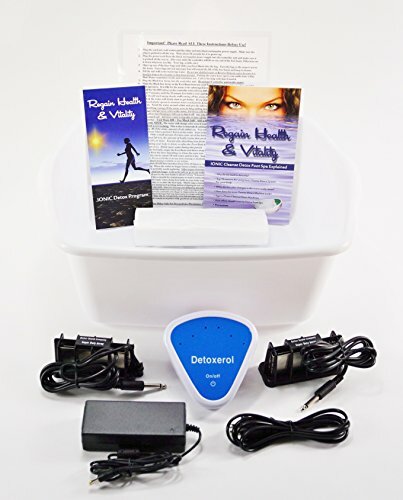 AUTOMATIC DETOX FOOT SPA JUST GOT BETTER! Completely Pre-Programed and Easy to Use with the Push of a Button! Super Duty Arrays Give a Fuller, Stronger Detox and will Long Lasting! If you have any questions about this product by BHC, contact us by completing and submitting the form below. If you are looking for a specif part number, please include it with your message.